The UK has a long history of using electronic neonatal data for research and is now in the enviable position of having electronic patient data on all admissions to National Health Service (NHS) neonatal units in England, Wales and Scotland. This national resource, the National Neonatal Research Database (NNRD), is available for research, audit, benchmarking and quality improvement. Here, we provide an overview of how data entered into an electronic system (Badger.net; Clevermed Ltd) as a component of day-to-day care, are used to form the NNRD and how this can be used by health professionals. For over 25 years, neonatal data have been collected in regional databases such as The Neonatal Survey. The availability of national neonatal data is, however, a relatively recent phenomenon in the UK and internationally. In the UK the use of electronic patient records shared across neonatal units began in 2004 as a regional initiative. This platform, Badger.net, subsequently expanded nationwide; it is now used by many neonatal units to plan services and record activity for payment by NHS England. 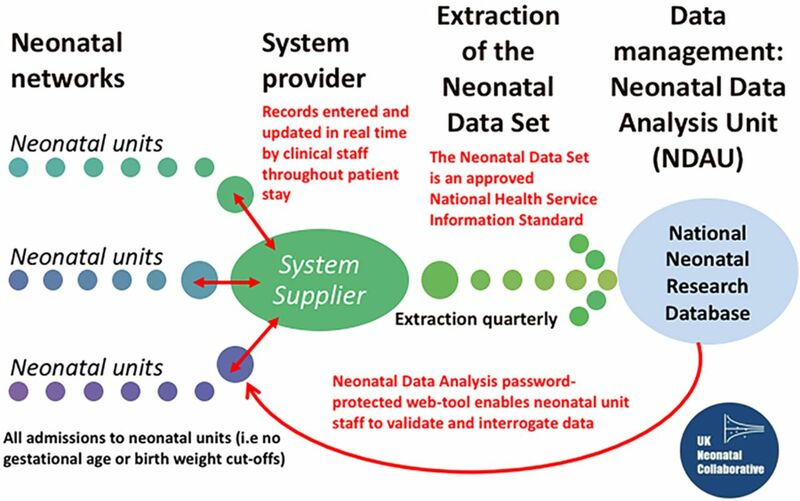 In 2007, the Neonatal Data Analysis Unit (NDAU) was established at the Chelsea and Westminster Hospital campus of Imperial College London to improve the quality of electronic clinical data and promote their use to support neonatal services and facilitate research. Data entered onto the Badger.net system are extracted at intervals, undergo quality assurance procedures, are anonymised and entered into the NNRD (box 1). All neonatal units that contribute data to the NNRD form the UK Neonatal Collaborative (currently 100% of neonatal units in England, Wales and Scotland). NNRD data originate from information entered by clinicians (usually trainees) and nursing staff onto the Bager.net platform at the point of care. Approximately 400 predefined data items, the Neonatal Data Set, are extracted quarterly from these electronic patient records to form the NNRD (figure 1). The Neonatal Data Set is an approved NHS Information Standard hence any neonatal electronic system must be able to capture these items. To date the NNRD holds data on approximately 500 000 patients with 20 000 added quarterly. Data include ICD10 codes and mapping to Systematized Nomenclature of Medicine–Clinical Terms (SNOMED-CT)3 is underway. Data flows to the National Neonatal Research Database. (Courtesy of Mr Eugene Statnikov and Professor Neena Modi). The NNRD is a national Research Ethics Committee approved database; Caldicott Guardians and Neonatal Lead Clinicians of all contributing Trusts have approved the use of the NNRD for health services evaluations and authorised research. Parents are informed about the NNRD and can opt out at any time. Neonatal electronic patient record data can be used by health professionals in a variety of ways. Identification of procedures (eg, percutaneous central lines). Identification of complications (eg, blood stream infections). Describing resource usage (eg, duration of stay). Many neonatal units have staff able to assist in using the electronic platform in this way; additionally Clevermed (the commercial provider of the Badger.net platform) can provide support: http://www.clevermed.com. If clinicians wish to use NNRD data for a regional, national or international project or in research, the NDAU can be contacted at https://www1.imperial.ac.uk/departmentofmedicine/divisions/infectiousdiseases/paediatrics/neonatalmedicine/ndau/. Costs of using the NNRD can be built into funding applications so we advise contacting the NDAU early in the development of a proposed study. Data entered by UK neonatal professionals into the Badger.net platform are used to form a unique resource, the NNRD. As a result of the diligence taken by the numerous (often trainee) doctors and nurses who enter data every day, the NNRD forms one of the most detailed, accurate and complete population level neonatal datasets worldwide. The NNRD can be used to support local, regional, national and international work ranging from audit to observational and interventional research. Paediatricians and neonatologists are ideally placed to identify research questions with the potential to improve neonatal care; the NDAU and the NNRD can support health professionals in undertaking such initiatives. Collaborators Members of the NDAU steering board are Zoe Chivers (representing the national charity Bliss), Kate Costeloe (cochair), Jacki Dopran, Jon Dorling (representing the Neonatal Clinical Reference Group), Chris Gale (trainee representative), Rebecca Lemin (representing Neonatal Network Managers), Azeem Majeed, Gopi Menon (representing the British Association of Perinatal Medicine), Neena Modi (Director), Ian Morris (trainee representative), Vimal Vasu (representing the United Kingdom Neonatal Collaborative) and Andrew Wilkinson (cochair; representing the Royal College of Paediatrics and Child Health National Neonatal Audit Programme). Contributors CG and IM conceived, drafted the first draft and subsequently revised this manuscript. All authors were involved in conception and subsequent revisions of the manuscript. Funding CG is supported by an Academy of Medical Sciences Starter Grant for Clinical Lecturers, AMS-SGCL10 (supported by the Medical Research Council, Wellcome Trust, British Heart Foundation, Arthritis Research UK, Prostate Cancer UK and The Royal College of Physicians) and a National Institute of Health Research (NIHR) Clinical Trials Fellowship, NIHR-CTF-2014-03-02. Competing interests CG and IM are voluntary, unremunerated members of the NDAU Steering Board. The NDAU receives no core funding and is supported by grants and donations, and through fees for commissioned services.